You know how you get organized at the beginning of each week so you can sail through the upcoming days happy and relaxed because everything is under control? I hope I’m not the only one laughing helplessly right now. What’s even funnier is that sometimes I actually delude myself into thinking I truly do have everything under control. That’s when Fate lets out a derisive laugh and upends my plans with unexpected detours, unavoidable delays, and unmet expectations. Two peacocks, just hanging out in the middle of the woods. Go figure. Mom and babies weren’t worried even when I walked up about fifteen feet away. Only a few more tons of rock to move. To give you a sense of scale, the post at the far right is almost 5′ tall. 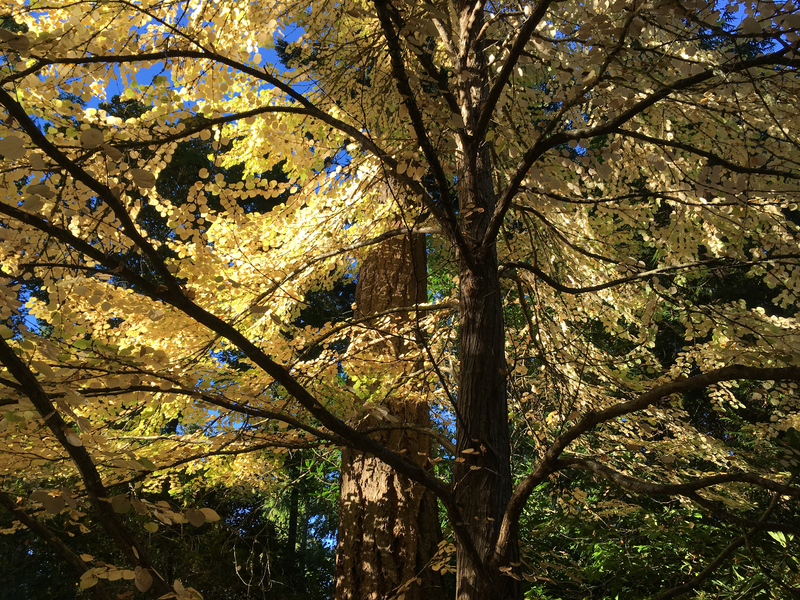 This golden gorgeousness is a katsura tree, which smells deliciously (and unbelievably) like caramel in the autumn. The beautiful bark behind it is a giant Douglas fir. Love your pictures. I don’t know where they come from or run off to but we get deer, turkeys, all manner of “wild” things. They seem to think they live here. And as for your plans that go splat. Ever heard of old Murphy’s law? Bahahaha!!! I’ll be there in a couple of weeks to check it out, but it had better be down to less than 8″ by then or I’ll run screaming! What you need is a couple of goats around your place. Check out Ron Ball, Feral Farmer, on Facebook and next time you are down in Cowichan Bay area, look him up. Another interesting character I met on Facebook and have never seen. His goats are real characters too. Love the Peacocks…reminded me, I have seen them running wild in an area of Los Angeles called Palos Verde. Coastal community that is built on a very large and I do mean large hill. 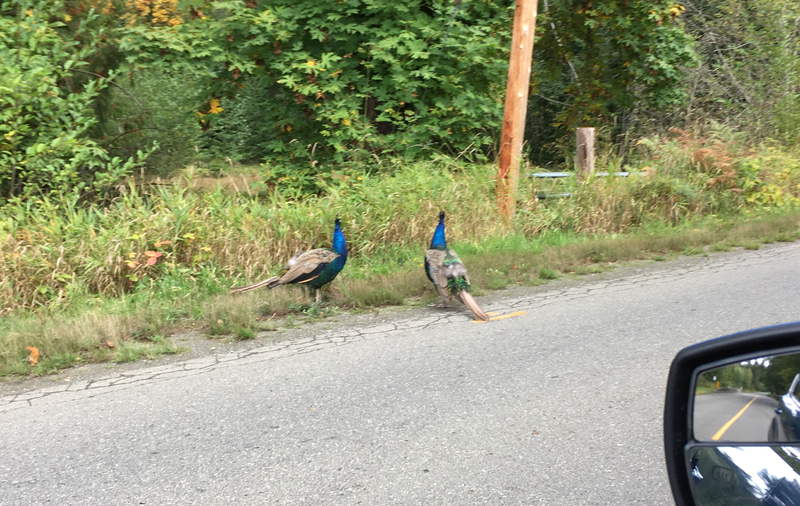 When you drive into the area…the hub bub of LA disappears and you see peacocks running wild….don’t know the history of how that started and had forgotten about it until I saw your post! As for the deer…obviously use to humans!! (saw Calgary got a ton of snow…seems too early, but I can remember those types of early snows when we lived in Denver). Have a great weekend Diane!! Well we have shovelled for the last 36 hours. Any peacocks likely couldn’t see above the snowbanks! Hope your upcoming week is calmer and of course snow free. That snow is just disgusting. I hope it’s not an indication of the kind of winter in store for you. Stay warm out there! 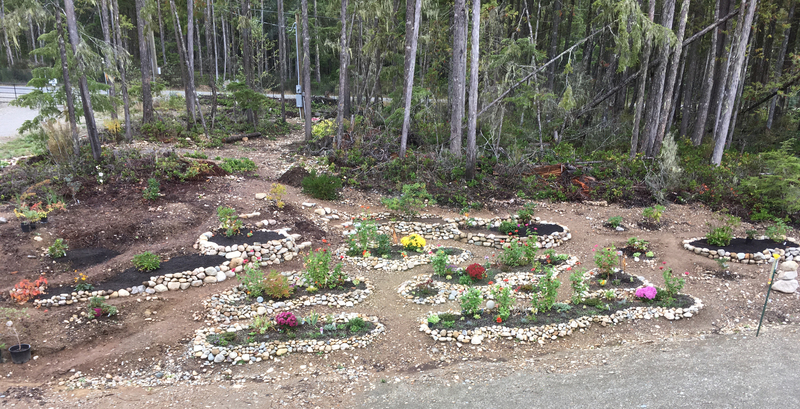 Your gardens are coming along nicely; I love the rocks as edging! And I know what you mean about the clock speeding up. Yikes. I can’t believe it’s October already! I’ve tried pressing the “control” key on my computer and that doesn’t work either. So far my week is going fine. Here at that office I’ve dealt with enough of the “high priority interrupts” to start thinking about getting going on Monday’s scheduled tasks. I’m expecting the boss to schedule an emergency meeting on why we’re getting so much emergency work so I’m really thinking of postponing this week till November when I’ll have more time to deal with it. I’m sure your boss will be able to solve your time crunch, though. For management, the solution is always easy: If you aren’t getting enough work done, then you need more managers. Kinda know what you mean. I’ve been saying I’m going to clean up my office/sewing room for what seems like months now. I have an “addiction” – printing off recipes that look interesting and something I might like to make. The only problem is I have several stacks of them that are a couple of feet tall and I couldn’t find what I was looking for if my life depended on it. I started out putting them in notebooks by category. They took up a two foot shelf and then an expanding file, then the stacks started. I think I’m just going to “bite the bullet”, bring in a giant trash can and shove everything in it, that is just as soon as I can get off the computer (after I’ve checked out all my favorite web sites, emails, etc.) The same goes for all the cones of yarn left over from my days of my knitting machines. After that I need to check & see if the local senior center would like all of my left over jewelry making supplies, etc, etc, etc. Of course I might have to take a nap first. It makes me tired just thinking about it. Ain’t procrastination great? I thought our fall was going to be here by now. Normally in the 70’s this time of year — this week in the upper 80’s. I usually get a month or two that the AC doesn’t have to run constantly. Doesn’t look like it will be that way this year. Are the peacocks normally there? Beautiful pics. 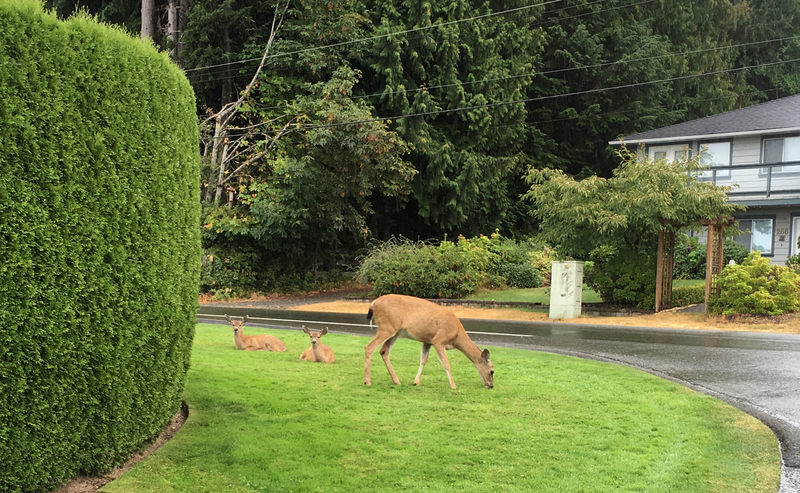 We have deer here also (currently hunting season), but they aren’t so “friendly”. Fall here takes about ten minutes. Green. Ohhh craaaaaaap. Brown. Spring is a little better. A couple of days, maybe. Cold. BATTEN DOWN THE HATCHES!!!!! (Thunderstorms and sandstorms together. Think raining mud and rocks. Sideways.) Bloody, flaming hot. So… tell me again why you live there? 😉 After living for 30 years in Calgary, I’m thrilled with the seasons out here on the coast. Calgary’s seasons are a lot like yours (only colder): Winter, which is alternately ugly-brown and muddy-white and lasts about 8 months; then spring for two gorgeous weeks in early May; and on the May long weekend it snows again, then hovers in the single-digits-Celsius and rains through most of June. Then the 30+C heat, drought, hail, and tornadoes start. Frost hits anywhere from mid-to-late August; and then everything’s ugly-brown again. Usually after everything’s dead the weather turns nice again for a few weeks, but it’s too little, too late. Keeping calm and carrying on here in the UK, Diane. Love that tree! Beautiful colors and great job capturing it. Things are looking pretty nice out there. I am always so disappointed with my plans not working or not even being a general guideline that I have given up planning altogether. That in itself has saved me some time to use to fix all the things that didn’t go according to plan. And thanks – the landscaping is slow and a lot of work, but the optimist in me keeps imagining how wonderful it’s going to look in five or ten years!